Then one day, I had a crazy cleaning fit and took all of my things off of my fridge, because I just can't stand fridge clutter. I tucked away the checklist until I could come up with a new solution. 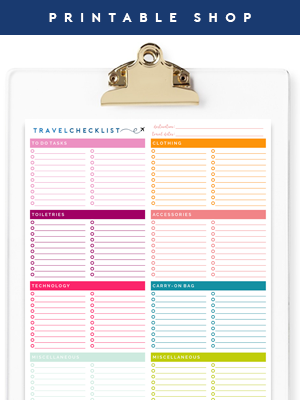 I wanted to be able to use the dry erase method for the checklist, but the laminated option began looking a little dingy and floppy. Then bam, it came to me! Love when that happens! 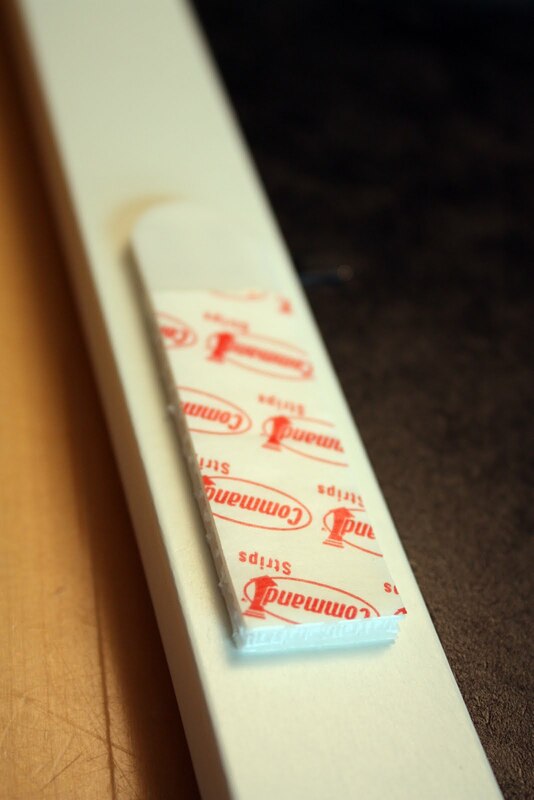 Glass is dry erase, and frames are less "floppy" than just laminated paper. You know where I am going with this now right?!! And then popped the frame onto the side of the fridge! The frame offers a much cleaner look! And I just heart how it matches our mail station PERFECTLY! But does it work? Um, YES! Smiles all around! Super quick and easy update that takes something from looking a little drab, to uber fab! I just heart when that happens! What have you been popping into frames lately? Anything other than art and pictures? That's definitely way classier than something stuck on the fridge :) I've been wondering how a glass-fronted frame would work for a dry-erase board in my office. Thanks! 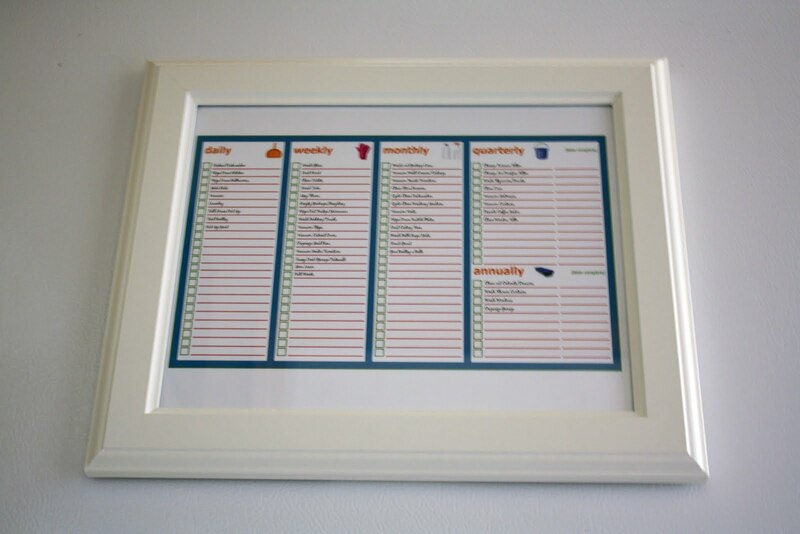 Do you have the cleaning checklist in an Excel format that can be edited on the computer? I'd love to use it (I NEED to use it!) and I'd like to type in the chores instead of writing it on by hand, but I don't have a good way of editing PDFs. I had the same question as Lisa. I'd love to be able to type the chores in myself b/c my handwriting can be a little messy. Also where did you put the other things that use to be on your fridge. i love this. thanks! i am very 'listy' person myself. keeps me in line. What a great idea! 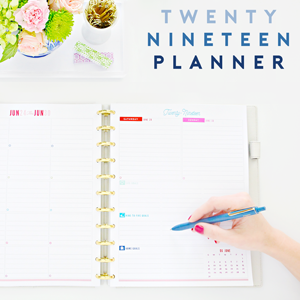 I've been using clipboards for my menu outline and family planner but this looks so much nicer. 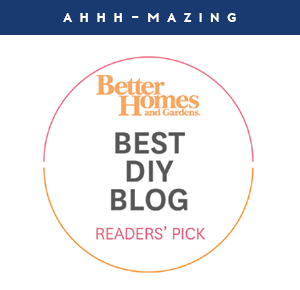 I just stumbled across your blog and LOVE it! You are so talented... not only a great eye for design, but a wonderful photographer as well! So many questions pop into my mind for my own house. A simple one to start with that drives me crazy in my kitchen... in your pictures of your kitchen you do not have a big, ugly drying rack for dishes. It takes up so much space on my counters. How do you get around that? You rock!!! I have a nanny record sheet on our fridge that I just put up with magnets. It is such an eyesore. Later today I am heading out for supplies to make this project happen. Thank you again for sharing. I actually do use a drying rack as well. It's a stainless steel one that fits in the right side of my sink when I am not using it. I just keep a dishtowel handy that I toss on the counter and place the rack on top of when doing dishes. Then, when I am finished with the dishes, I toss the rack back down in the sink for them to dry and put them away later. I keep the towel rolled up next to the sink, so it's always super handy. Cute idea and thanks for the print out! 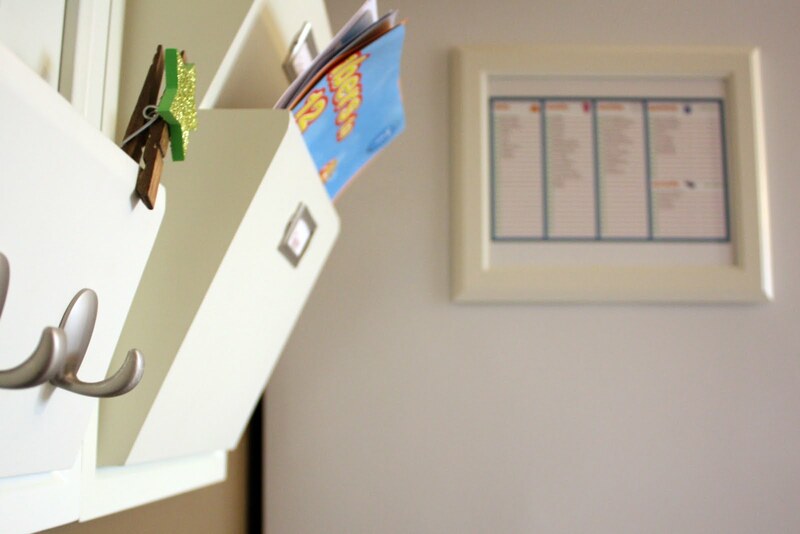 You can also Google image search "organized entryways" for a lot of added inspiration and ideas. I love this idea and am sending you an email for a version to edit the chores. Thanks! Oh wow- thank you so much or sharing this! Your list is fantastic. I would love to link to it if you didn't mind. Of course you can Rachel! fyi, you can use a sharpie and it will wipe right off of it with the cry erase marker spray or windex. smears less than a dry erase. Great idea, and I love the download! 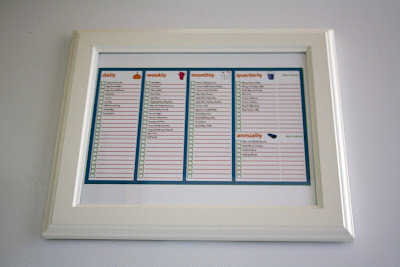 My weekly menu plan is in a frame; that way if hubby changes the plan while I'm at work, no need to print out a new sheet! I had no idea sharpie worked! Thanks so much for the info! Hey girl, you used all my favorite things in one post. I love this. I just updated mine (it's almost like yours) a few weeks ago. Hubby is amazed it really works. The kids will ask if they can do something and I'll say "Are your boxes checked off?" It's so working! 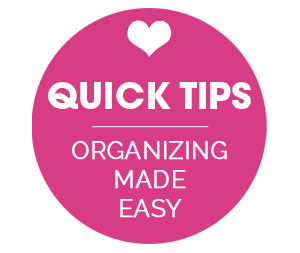 Thanks for linking to We're Organized Wednesday. Jen! Your blog is so cute! I love your design, it's so pretty to come to! 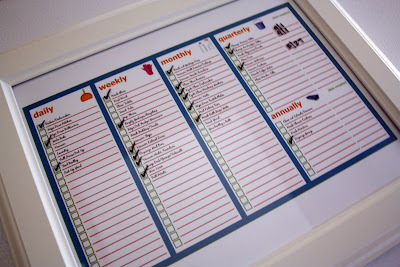 I am an organization FREAK so I am all about your cleaning list and I love the idea to put it in a frame so something that is so helpful looks fabulous too! Thank you for joining us at A Crafty Soiree! I hope you'll come back next week and link up again! In case u didn't know, command feature this post on fb! 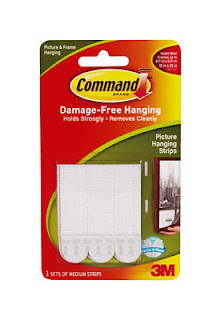 I love command products and love the idea of frames on the fridge. Much classier than magnets for long term stuff! 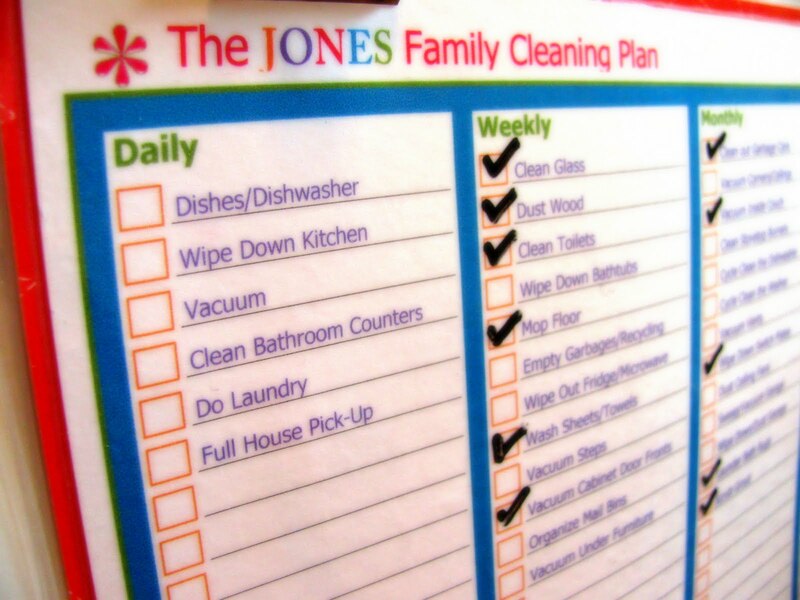 Can you put a pdf of your actual cleaning list? I've downloaded the template and wrote in our famiy's daily and weekly cleaning responsibilities, but would like to see what you do on the monthly/quarterly/annually portions. Great idea. This would be good for a pantry/deep freeze inventory too. I never know what's in our deep freeze. Seriously. It's a problem. Is this cleaning list available in a format other than pdf that can be edited without having to write everything in by hand? 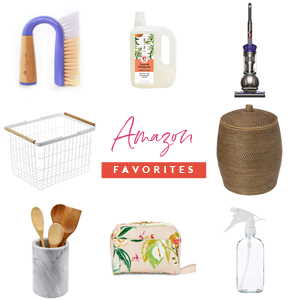 LOVE THE LIST AND IDEAS! Thank you so much for the great inspiration I needed! Unfortunately, at this time I am only able to offer non-editable PDF options to protect the copyright of the document itself. P.S. Seriously love your blog! Jen. I LOVE THIS!!! I tried to download the PDF and I couldn't. Any suggestions? Thanks for this list!!! The PDF isn't working.. is it still available? I loved the picture frame idea and just put one up in my kitchen. I decided to use a homemade calendar inside it along with some open space for notes and lists. Anyway, I was wondering where you keep the markers and eraser for the board you have on your fridge. I'm trying to come up with a solution to keep those items close to the board itself for convenience. Any ideas? I keep mine in a wall pocket/memo station nearbye, however, you could also add a magnet to the items and attach them to the fridge, or find a small magnetic pocket. I actually don't use an eraser any longer, I just use some spray and a paper towel.